Isn’t that what grannies drink? Isn’t that what Uncle Monty drinks? Isn’t that what they put in trifle? With years of combined experience in various aspects of the wine trade (but admittedly precious little in front of the camera) and a dedication to sharing our love of this much-misunderstood wine, we’ve got the answers. For a potted history on sherry - and a laugh at our expense! - check out our XECO mini-movie or scroll down for more info on how to enjoy our wines. Our XECO Fino is made from the Palomino Fino grape variety which produces a crisp and refreshing dry wine that is extremely versatile. Like all sherries, it is made through a special process of fractional blending that is unique to wines from Jerez in Spain (but for more on that, please visit our blog) and has been aged for four years on location in Andalucia in American oak casks. This gives it a uniquely dry and savoury quality that works brilliantly with all sorts of food - from olives to sushi to fish and chips! Drink it extremely well chilled, either straight-up in a wine glass or mixed with your favourite good quality tonic or lemonade to make it sparkle. The Spanish pronounce it ‘ah-mon-ti-ya-doh’ but you can say it however you want - in the XECO office, we refer to it affectionately as 'Monti'. In any case, however you say the word won't change its wonderfully nutty, aromatic character, its glorious amber hue or those subtle flavours of sun-baked fruit and fresh vanilla. Amontillado wines are partially aged oxidatively meaning the wine has been aged in contact with oak. Rich and really quite sweet on the nose, this wine is bone dry by the time it lands on your tongue making it a wonderful - surprising! - aperitif. Always drink it chilled - almost certainly alongside a slice of cheese. Yum. XECO sherries are fantastically easy-going wines. Due to the special sherry production method, the wine is non-vintage and consistent year after year - and they can be kept in the fridge for up to a week (without the need of those vacuum wine conservers). It’s said that simplicity is the ultimate sophistication, which is probably why most people drink it very chilled and straight up. Then again, people say all sorts of things. We say, drink it however you like it. At XECO H.Q. we're drinking our Fino this winter in a XECO GINGER - with a good slug of ginger ale and a dash of peach bitters; absolutely delicious. We've also gone crazy over TUXEDO MARTINIS: Gin, XECO fino and a twist of orange (and optional orange bitters). 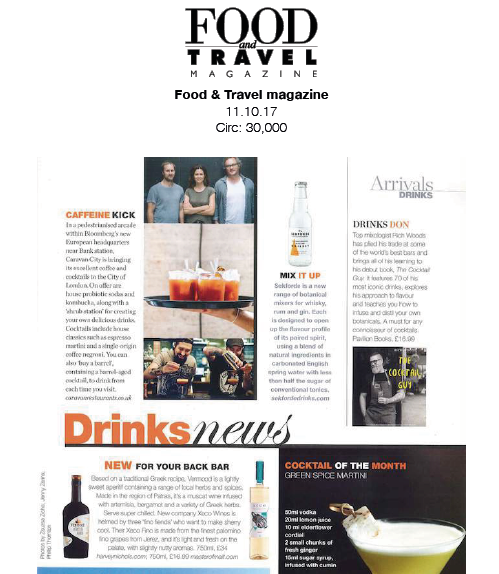 The ‘Monti’ is also scrumptious in a Autumnal Sherry Cobber with lots of seasonal fruits such as damsons, plums and pears - as recently feature in The Telegraph’s Christmas Drinks round-up. 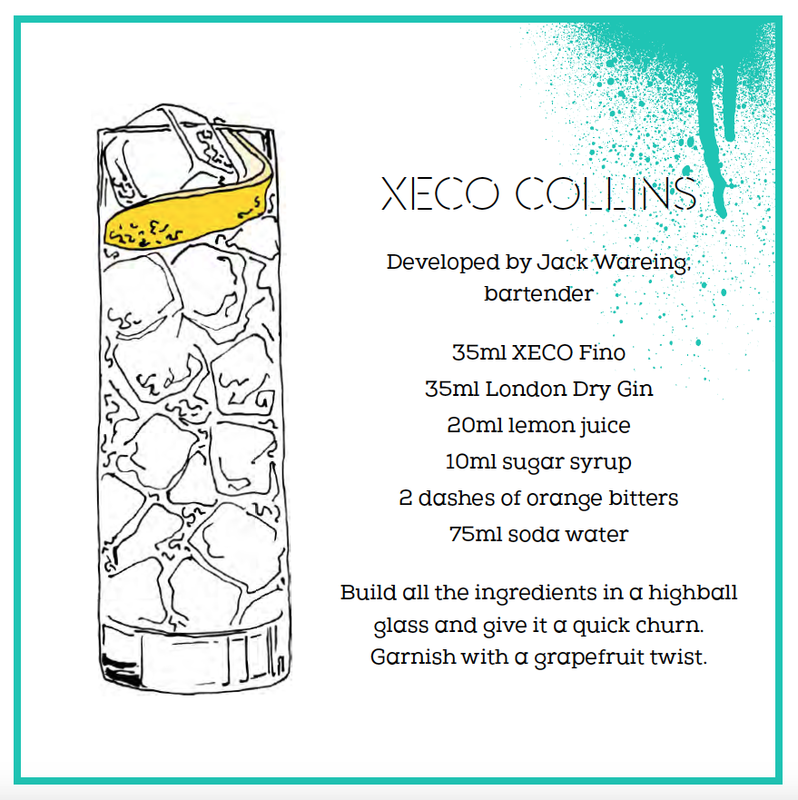 Here are a selection of some of our other favourite serves... Let us know how you drink yours? And be sure to spread the word and tag #XECO on Instagram. 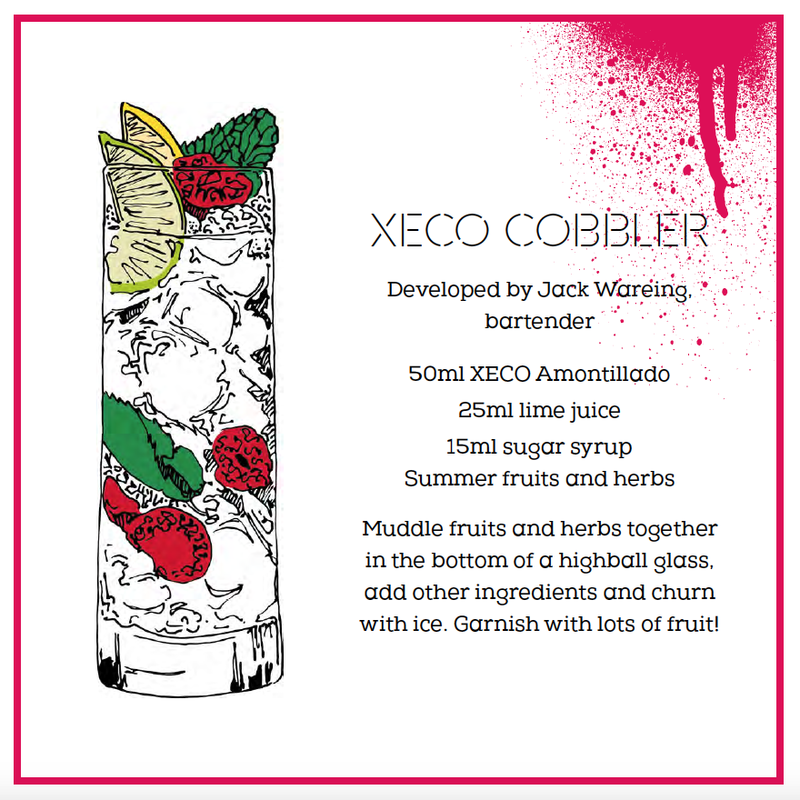 MONTI COBBLER - Amontillado sherry, seasonal fruits, lime, an optional dash of soda. XECO is the brain-child of three 30-something 'fino fiends' who have long shared a love of fine sherry - and a frustration that this love wasn't shared by friends. With 30 combined years of experience in the industry, the trio share more than just a love of this magical Spanish wine - they also have a deep understanding of how it’s made and of the wonderful traditions upon which it is built. In early 2016 they set out to create a new brand of sherry to put a contemporary edge on an age-old product, and in doing so help to dispel some of the myths around the category and encourage a new generation of discerning drinkers to give sherry a second look. To do so, they teamed up with a magnificent Spanish sherry house ('bodega') that has been producing sherry wines since 1876. So, although the name may be new, the wines have a long and distinguished lineage. 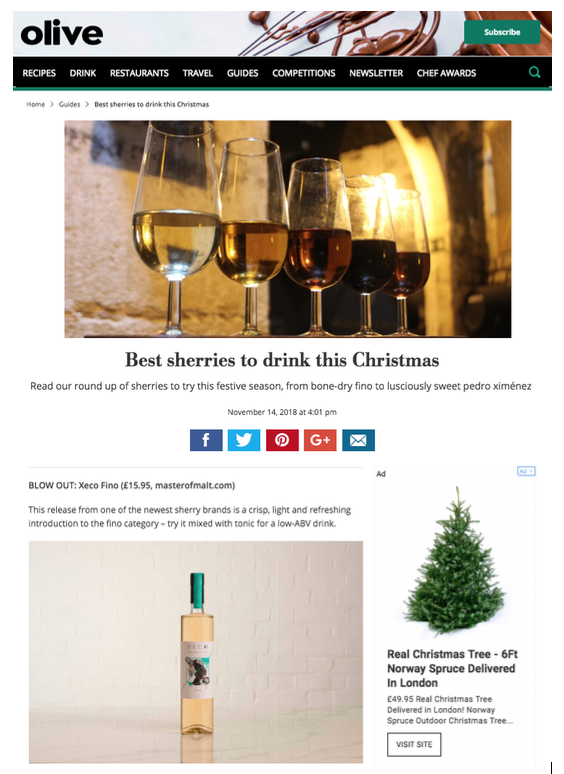 Aside from Spain, nowhere is so closely associated with sherry than England. Trade has existed between the two countries since the 13th Century and although we haven't always seen eye-to-eye on everything, the one thing we've always shared is a love of sherry. We wanted to celebrate this, so have drawn up a cast of characters from both countries' rich histories, all of whom have been inspired to write about, drink and indeed even steal sherry wines. In our view, there is no better barter than that which was brokered between Alfonso X and our king Henry III - sherry wine for English wool. Alfonso X lived up to his name, “The Wise”, as following the Treaty of Alliance in 1254, sherry entered the English consciousness as a go-to ‘tipple’ for any occasion. Even today, the English consume only marginally less sherry than the Spanish! Daughter of the Spanish regents, the beautiful Princess Catherine was only 3 years old when she was betrothed to Arthur, Prince of Wales and heir apparent to the English throne. When Arthur died, she married his younger brother, Henry VIII and became the first of his (in) famous 6 wives in a renowned, ill-fated, English-Spanish alliance. She reportedly complained, "The King, my husband, keeps the very best wines from (...) Jerez for himself." Reviled as “El Draque” or “The Dragon” by the Spanish, Francis Drake infamously made off with 2900 casks of sherry having sacked the town of Cadiz, near Jerez. We celebrate not his piracy, but rather the glee with which the Sherry was received when he returned to London and presented it to Elizabeth I – cheers ensued, in both senses of the word! Nowhere else in the world makes this particular style of wine with its unique system of 'criaderas' and 'soleras' - also known as the 'solera system'. To create our wines, XECO has collaborated with a beautiful and historical bodega called Díez Mérito which laid down its soleras in 1876. Thanks to the vision of its new owners, the Espinoza family, Diez Merito is entering a new chapter in its distinguished history. The region’s soil and climate, the family’s skill and dedication and a firm belief that sherry is ready for 'a revolution, a renaissance', matches perfectly with the ambition of XECO to put sherry on the map for a new generation. Click on the Insta-feed below or the news articles to find out what the Xequitos have been up to! Please stay tuned for updates as our list of online and offline stockists grows! Thank you for contacting XECO wines! Thank you so much for your interest in XECO Wines!